Sunset Boulevard is a waste-heap of broken dreams and the wreckage is visible everywhere. The bric-a-brac backstage at Paramount Studios blends into the shabby luxury of faded star Norma Desmond’s mansion-mausoleum. Director Steven Pike’s production of Andrew Lloyd Webber’s beautiful and gaudy musical is appropriately lavish and gritty, relishing every desperate moment in a story of junkies fighting for their next fix. The twist is that these junkies are all actors and writers and the adrenaline hit they’re hungry for is the rush of fame. In post-World War 2 Hollywood a genuinely talented would-be screenwriter, Joe Gillis (Daniel Wells), is scrambling to survive. He finally gets what seems to be a break when he meets one-time screen goddess Norma Desmond (Bronwyn Sullivan). Desmond offers him too-good-to-be-true money to play script doctor to her vanity project, a kooky screenplay for Salome that Desmond insists will resurrect her career. Gillis agrees because he needs the money – but also because he’s somehow fascinated by this Queen in exile. Norma entices and manipulates Desmond until he is unable to leave her world, becoming both her prisoner and her pet. Daniel Wells’ performance as Joe Gillis is sensational, making smart choices that give us a rich depiction of the character. On the surface level Gillis goes along with Nora because he is broke and hungry for success, but Wells shows us that he is also drawn to Norma – both out of pity and out of some deeper longing. His scenes with potential love-interest Betty (a spunky Vanessa De Jager) are a highlight: even when just talking business the pair have a constant awareness of each other’s bodies and move towards and away from each other in a delicate courtship dance. I’m so used to seeing musicals where the lovers have zero chemistry (usually when singing fervently about how much they’re in love) that it was a joy to see a stage romance done right. While Gillis is our cynical link with reality, Bronwyn Sullivan’s imperious and magnetic Norma insists that reality is whatever she wants it to be. Norma refuses to accept that she is almost completely forgotten. Even her daily fan mail is now only the artifice of her devoted butler (Norma don’t look too closely at the postmarks). Sullivan is perfectly cast as Lear in chiffon, simultaneously sinister and slightly loopy. She is always half-playing to the audience – both the one in the theatre and the one in Norma’s imagination. This brilliant approach that pulls us effectively into Norma’s world. Peter Dark also excels as Norma’s fanatical butler Max. Max is the ghost at the banquet, a spectral figure hovering at the verge of scenes. 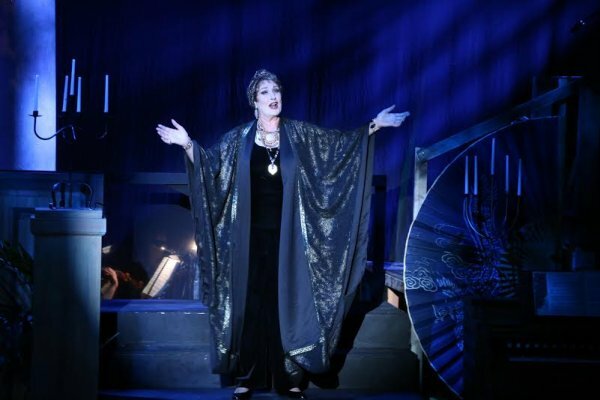 His powerful singing conveys his complete obsession with Norma – almost eclipsing Norma’s obsession with herself. While Max is a tragic and fairly sympathetic character, as the story unfolded I began to see Max as an enabler: his motives may be understandable but he is always on hand to nudge Norma a little further into isolation and self-destruction. The ensemble do an excellent job of conveying the liveliness of the motion picture business. The dancing is simple and fails to engage – it’s competently done, it’s just not very exciting. However the ensemble does a lot of fine character acting and there are lots of nicely drawn tableaus and quirky conversations that make the setting feel alive. It felt like the ensemble were real people with their own stories to tell – when Gillis is around the workers at Paramount he doesn’t feel like the lead in a musical, he feels like just part of the crowd. Lloyd Webber’s music is haunting but the real draw of this production is its psychological richness: fine acting by the four principals gives Billy Wilder’s original story the heft it deserves. This is that rare thing, a musical that is interesting for not just for spectacle, but for the inner drama unfolding in the heads of the characters. Norma’s celluloid dreams may have faded quickly from memory, but the oily grit of reality in this production will linger in the memory of audiences.